Hindustani Vocal Recita by Maitreyi Majumdar from Delhi, disciple of Dr Shanno Khurana. 06.30 PM. Venue: India International Centre, 40, Max Muller Marg, Lodhi Estate, Delhi. An Evening of Indian Raagas presented by the disciples of Shrishti Chatterjee on the occasion of Gurupurnima. A tribute to the eternal Guru. 07.00 PM. Venue: South Patio, Block D, South City II, Gurgaon. Pt.Omkarnath Thakur Sangeet Samaroh. Hindustani Vocal recital by Dr.Raghunath Sahoo, disciple of Pt.Dr.Damodar Hota. Collab: Swar Samarpan. 07.00 PM. Venue: India Habitat Centre, Lodhi Road, Delhi. Lok Kala Manch presents Swaramritam by Shri Abhik Kumar Sarkar - Sarod (Disciple of Ustad Amjad Ali Khan). And accompanying Artist - Ustad Akram Khan - Tabla. 06.30 PM. Venue: Vasuki auditorium, Lok Kala Manch Institutional Area, Lodhi road, Delhi. A Musical Collage of Various Indian and Western genres including Sufiana, Qawwali, Baulgeeti, Vocal Symphony, Drums Ensemble, Hindustani and Carnatic Classical music by Sky Band. Conceived and directed by Sovon Hazra. 07.00 PM. Venue: India Habitat Centre, Lodhi Road, Delhi. Sitar Recital by Nishindra Kinjalk from Delhi, disciple of Pt Uma Shankar Mishra and Pt Gopal Krishna. 06.30 PM. Venue: India International Centre, 40, Max Muller Marg, Lodhi Estate, Delhi. Vocal Recital by Aditi Sharma, disciple of Pt.Shri Datt Sharma. Followed by Violin recital by K.Rohan Naidu, disciple of Pt.Devashish Dey Collab: Sangeet Sankalp. 07.00 PM. Venue: India Habitat Centre, Lodhi Road, Delhi. Violin Recital by Aleem Khan. 07.30 PM. Venue: Epicentre, Apparel House, Sector 44, Gurgaon. Sarod Recital by Pritam Ghoshal, disciple of Ustad Amjad Ali Khan. Accompanist: Durjoy Bhowmik (Tabla) Collab: Kalpataru Arts. 07.00 PM. Venue: India Habitat Centre, Lodhi Road, Delhi. Hindustani Vocal Recital by Shalini Ved from Kanpur, disciple of Smt Girija Devi. 07.00 PM. Venue: India International Centre, 40, Max Muller Marg, Lodhi Estate, Delhi. Sitar Recital by Debajit Chakraborty from Kolkata, disciple of Pt. Manilal Nag and Shri Santosh Banerjee. 06.30 PM. Venue: India International Centre, 40, Max Muller Marg, Lodhi Estate, Delhi. Santoor Recital by Dr.Bipul Kumar Ray, disciple of Pt.Bhajan Sopori. Followed by Hindustani Vocal recital by Pt.Harish Tiwari, disciple of Pt.Bhimsen Joshi Collab: Raganjali Academy of Music. 07.00 PM. Venue: India Habitat Centre, Lodhi Road, Delhi. Sitar Recital by Dr.Sudeep Rai, disciple of Pt.Debu Chaudhuri. 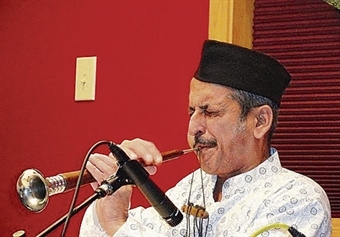 Followed by Hindustani Vocal recital by Dr.Anis Khan, disciple of Ustad Iqbal Ahmed Khan. 07.00 PM. Venue: India Habitat Centre, Lodhi Road, Delhi. Hindustani Vocal Recital by Madhumita Chattopadhyay from Kolkata, disciple of Smt Purnima Choudhury. 06.30 PM. Venue: India International Centre, 40, Max Muller Marg, Lodhi Estate, Delhi. Sitar recital by Smarajit Kumar Sen, disciple of Pt. Buddhadev Dasgupta & Sujat Khan, followed by Jugalbandi of Sitar & Vocal by Smarajit Kumar Sen & Anirban Bhattacharya. 07.30 PM. Venue: Epicentre, Apparel House, Sector - 44, Gurgaon. RaagRanjani celebrates Baisakhi with traditional songs. Followed by Classical Vocal recital by Pt.Bholanath Missra. 07.00 PM. Venue: India Habitat Centre, Lodhi Road, Delhi. Swathi Thirunal Festival 2014 - Day 1. Carnatic Vocal recital by Sreevalsan J. Menon. 07.00 PM. Venue: India Habitat Centre, Lodhi Road, Delhi. Opera Concert by Soloists of the Neemrana Vocal Ensemble. Presented by Situ Singh Buehler, Opera Studio Works by Mozart, Schubert, Bellini, Puccini and others Accompanied on the piano by Dinaibo Rentta and on the violin by Ganesh Dutta. 06.30 PM. Venue: India International Centre, 40, Max Muller Marg, Lodhi Estate, Delhi. Hindustani Light Classical Vocal by Pt. Ravi Jule(Disciple of Pt. Mani Prasad). A Soulful Mehfil of Ghazals, Sufee, Thumari etc. 06.30 PM. Venue: Bhavan's Cultural Centre, Bhavan's College, Munshi Nagar, Andheri (W), Mumbai. Hindustani Classical Vocal by Pt. Dinanath Mishra(Banaras Gharana) VocalSupport: Mangal Mishra Accompaniment: Niranjan Lele(Harmonium) Jaishanker Mishra(Tabla). 06.30 PM. Venue: Bhavan's Cultural Centre, Bhavan's College, Munshi Nagar, Andheri(W), Mumbai.